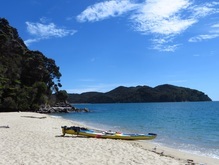 Experience a taste of what the Abel Tasman has to offer. This walk closely follows the coastline with lovely views across several bays and beaches. We stop for a picnic lunch and a chance for a swim at the picturesque Apple Tree Bay (pictured below). After lunch we gently ascend over a saddle and then drop down into Anchorage, a sheltered haven for boats and kayaks. Enjoy an exciting ride back to Marahau by water taxi – a great opportunity to view this beautiful piece of coastline you have just walked, from the sea. Finish in Anchorage and return to Marahau by water taxi.